Having not stepped foot in the British Isles for more than a few hours since February, there have been a few changes over these last months. The streets of Oxford have their transient shops, going through waves of success and failure, and changing week on week, but despite the new facades it feels something like home. I count myself as lucky that while I don't currently feel I have a place to call home (knowing that at each stage of my journey I will, sooner rather than later, be moving on somewhere else), I actually feel quite at ease in this state of fluidity. I spent today back in the centre of Oxford working in a couple of cafes before coming home to tea and mince pies to continue study. I have two more projects that we would like to finish before Christmas and these will keep me out of trouble for the coming weeks. Thankfully television is no distraction. In my hotel in Dublin I made the mistake of turning on the TV (the first time I've seen television in many many months) and realised that I'm so out of touch with British pop culture that I have no idea who any of the "celebrities" on the unending, jaw-droppingly bad reality TV shows are. Such ignorance fills me with more than a little pride. I don't have a raft of exciting tales to tell from Dublin, though yet again this charming, if outrageously expensive city brought several days of enjoyment, both through plenty of scientific discussion, the odd guinness and a little time to tour the city. On an icy cold Saturday I sat atop an open-air bus to see the city, something that I can highly recommend if you have a short time to see somewhere you don't know well. Touristy though it appears, it's convenient, and unless you're reading up on the place before you arrive, you're likely to learn a great deal whilst catching all the highlights. 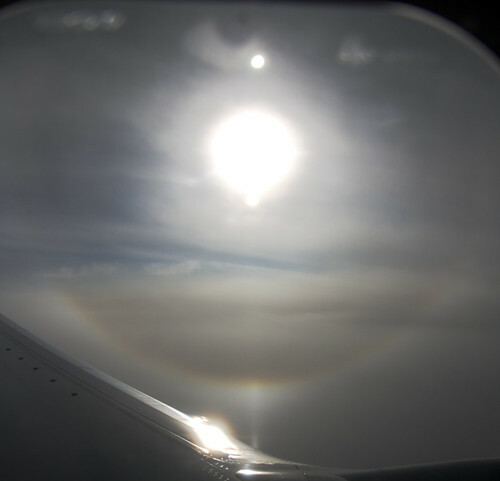 Anyway, the only other tale to tell is of the flight over from Stansted to Dublin where, above the murky cloud-line I was greeted with another wonderful halo display, this time witnessing my first ever sub-sun as the light reflected of the plate crystals in the clouds below us. 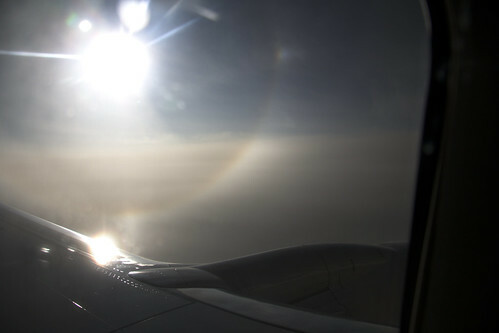 Seated over the wing (in order to take advantage of the leg-room) I missed out on any possible Subparhelia but caught a few glimpses of sundogs, changing quickly as we passed layers of cirrus clouds. 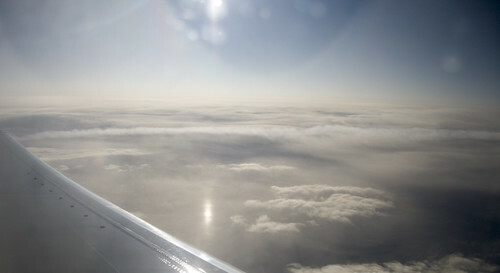 As always consult atoptics for the full explanation of these phenomena. Hey, the looks are really stunning! Keep it up.